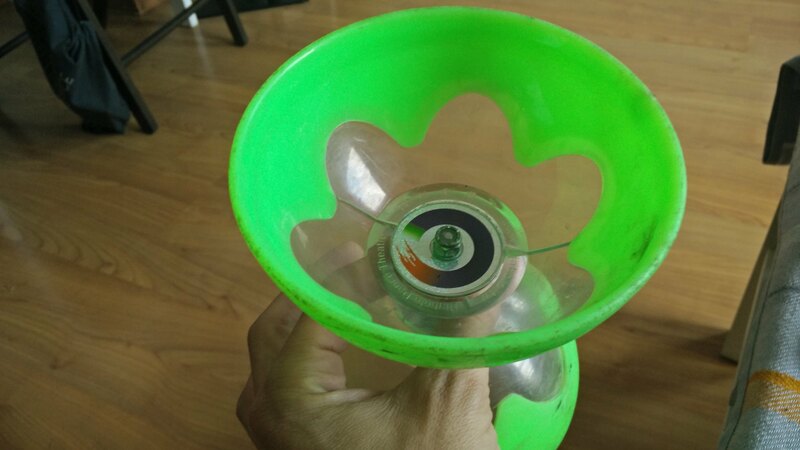 Hyperspin diabolo is a diabolo that has been around Asia for more than a year, and since then, people outside from Asia have seen that these diabolos are suitable to pull up some very difficult tricks. I was contacted, like many others, and offered some slightly cheaper diabolos and in exchange I was suppose to review them. So why not make it in public? I have had the funny situation that in the EJC I was the only person that had 3 Hyperspins with fixed axle, so I had tons of people trying them and giving me feedback. Additionally I have asked Luis Reis, Pieter Slachmuylders to write their opinions down. So I am directly copying them here for you, and on top of that I will transmit part of the opinion from Sebi Haushofer. - The biggest downside is the durability. One of them got broken 2 months. Apparently the transparent part of the cup is the weak point. Crazy, almost no vertax, and I never break diabolos... I also have notice of other people breaking several of them. From Hyperspin they said that if you train a lot in vertax on a hard surface they may break. Luis Reis below claims that high throws are the riskiest. He even had a case of broken axle. 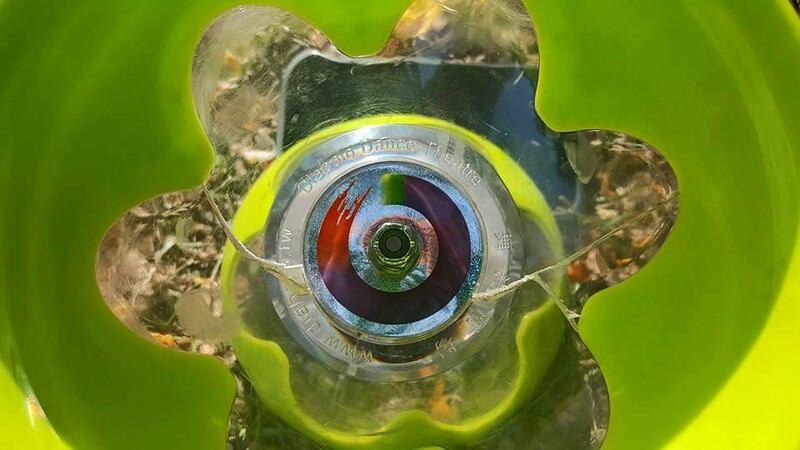 - So far the company is providing exchange cups if your diabolo gets broken but I can't guarantee they will keep doing it. - LED kit: I have not seen them live, but in this video (offline now) they look pretty cool I have them and the are truly awesome. The most simple nice thing for me is that the three LEDs have a different radius, so when turning they describe three concentric circles. This video does not show much, but there it is. Hyperspins are really smooth when you catch them on the string. Compared to other diabolos which feel like 'rolling' over the string the Hyperspin slides over the string. Personally, for tossing up the diabolos when doing high, I like the cups very much: they are empty, no letters and lines/edges etc. I also found out the Hypersin bounces really well, a thing I personally like. [Note from Wis]: I confirm that the metal piece with the logo is noticeably noisy when it with the nail. First of all Hyperspin Diabolos are the best diabolos are in my point of view the best diabolos that I've seen on the Market. Meanwhile, as a diaboloist i'm more of a Artist Performer than a Trickster and that makes a lot of difference. Hyperspin: are the fastest Freebearing diabolos that I've seen, the most well design, they are gorgeous and simply awesome. They are just the best diabolo for a stage performance. mainly if you're the kinda of guy who likes to do Vertax skills. Meanwhile for all trickster the Hyperspin diabolo will more be like a BAMBOO Diabolo, Amazing.. but to keep in the closet since is very fragile to the chocks, It's very resistant and you can drop it in the floor in vertax mode from almost anywhere, contrary I don't adivise you to pratice High tricks, like siteswap with it, the more speed and weight the diabolo have the more are your chances to brake it, even if you just bought it. Hyperspin are amazing and i really advise it if you want to do performances with it, meanwhile you must re-check your techniques and see if they are not dangerous for the diabolo, throws in the air, kicking the diabolo, throw it at the wall, just be careful with it or you will be pissed in no time. In my case i still training my normal tricks with the Epic Juggling Diabolos since they are awesome and only use Hyperspin in stage or for Vertax tricks. and that the weight is distributed mainly in the center of the diabolo and that why he is very stable ! but never practice vertax or dangerous tricks for the diabolo so if you say the durability is not good i trust you ! For me the biggest downside is the design, i'm not a fan of fantasy look is cool for some fun look but i really want a hyperspin with classical look pure white look and that would be perfect ! I know many people are raving for Hyperspin with fixed axle. There are not fixed axle right now because they didn't like the first model they made, yes, the one I had and used to write this review. Apparently in may wobble too much. Strange because I felt they were perfect from this perspective, maybe I got some great pieces. Well it's taken a lot longer than expected but the fixed axle versions are available. I tested them around September of last year for Oddballs when Wis wrote this review and since they are finally available I wanted to make the review public. I wrote an original review about a year ago and I have updated it for this forum so it includes some comments about diabolo design which I consider when I test diabolos with the aim of being transparent. I hope that if you are unsure whether to splash out and buy these diabolos then you will sit through my rambling and you will come out at the end of it with a more informed opinion. Let’s start things off with the design, personally I find it is stunning. 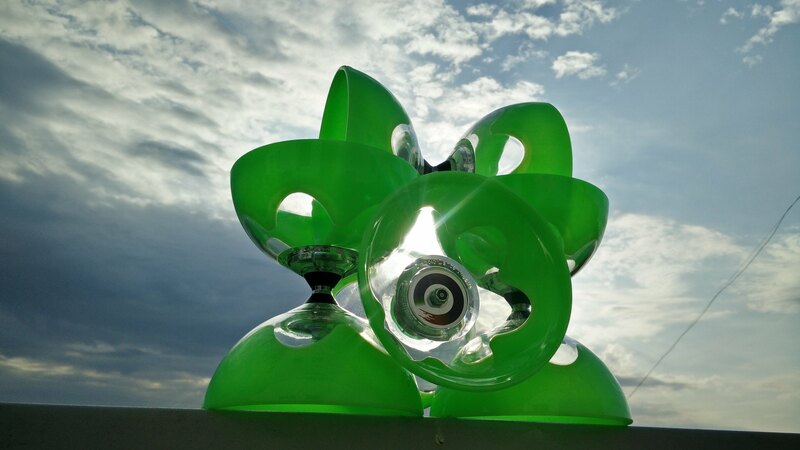 Obviously aesthetics are subjective and while I have heard some people joking about not wanting to ‘spin a flower around’ it is my personal opinion that once it is spinning the effect of a perfectly transparent inner hub slowly merging with a normal coloured cup is quite mesmerising. The vibrant colours (apart from the purple which seemed rather dark for my taste) are easy to see. They also work far better with LEDs than any other diabolos I have seen thanks to the aforementioned transparent section. While many may argue that aesthetics are secondary to everything I feel that in this day and age where diabolos are very similar in many respects we have the freedom to let aesthetics influence our buying decision much more. One must also remember that diabolo is an art and a form of expression upon which many people base their careers. 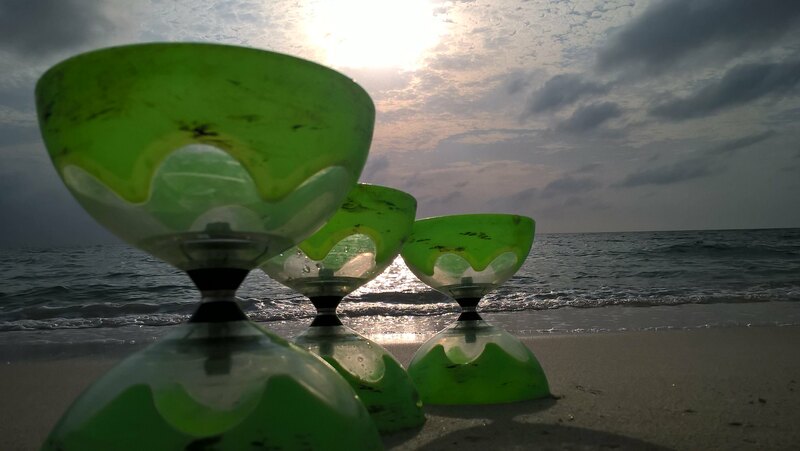 It is an inherently visual art and making a diabolo that looks good is an important factor in performances and video production that many take into consideration. I think it’s also important to mention that Hyperspin have managed to make the transition between the two materials completely seamless, not once did my string catch on an imperfection and that is hard enough to achieve with a normal diabolo let alone one with such a complex design. After testing the diabolos for a brief period of time I was left scratching my head as to how Hyperspin managed to make a diabolo that feels so smooth on their first attempt. This diabolo has first class dimensions and proportions which are very similar to that of a Sundia EVO which for years has been my go-to diabolo. The weight is a very interesting subject since they actually managed to fool me for my first few practice sessions into being lighter than they actually are. It wasn’t until a friend of mine asked me whether I found the Hyperspin diabolos a bit too heavy that I started getting suspicious. I am a numbers juggler and saving as little as 10g on each diabolo means that when I juggle 3, 4 or even 5 I am saving 30g, 40g or even 50g respectively which is definitely noticeable. I decided to measure the weight of the Hyperspins and found that the weight was the weight impeccably consistent, this deserves a lot of emphasis since a difference of a gram or two in one cup is enough to make a diabolo favour turning in a certain direction which makes juggling multiple diabolos very difficult since you have to constantly focus on correcting the diabolos rather than concentrating on the trick you are about to attempt. I remember being baffled when I went to a convention abroad and had to disassemble my old Sundia diabolos and upon assembling them again at the convention I realised one or two were persistently favouring a certain direction and turning within a couple of rounds. I fixed the problem very easily by measuring the weight of the cups and pairing them with their most similar counterpart and haven’t been bothered since however I haven’t disassembled any diabolos when going abroad for many years since travelling with weighing scales is inconvenient to say the least. After measuring them I discovered that they were a whole 18g heavier than my Sundia diabolos (which weigh 230g). I was surprised to find that I failed to spot such a drastic difference after first picking them up. When swapping between the EVOs and the Hyperspins directly it became clear that one was heavier than the other but not an 18g difference. I believe that this has a lot to do with the weight distribution that Hyperspin decided to go with, I am very happy that on their first attempt Hyperspin managed to make such a good job with their design, it shows that they have really committed to their R&D which means a lot since buyers can be sure they aren’t buying a ‘Gen 1’ product that is going to become obsolete within a few months or years but rather a fully developed diabolo. Like with any other aspects weight is subjective, I found this diabolo to be really good for 3 diabolos and high diabolo where an increased weight provides stability at low speed and lets you know that the ‘diabolo is there’. When I say this I have in mind tricks such as a 3 diabolo low cascade or mini columns which I like to call ‘manipulation’ tricks. When doing these tricks you have to rely heavily on using the weight of an incoming diabolo to your advantage so that you may throw it against its spin and a tiny bit of extra weight often provides that much needed 'feedback' through the string. While this means that I wouldn’t personally use these diabolos for long 4 or 5 diabolo sessions due to the added weight I am content with Hyperspin choosing this weight since it isn’t too heavy to get very tired nor is it so light that it ruins the structural integrity. To clarify I have used these for both 4 and 5 many times for half-hour to hour-long jams but for longer intense practice sessions I have chosen to go for lighter diabolos instead. The axle is really something special as well and I know I am not the only one who has noticed. It has a very similar design to the Sundia EVO diabolos and it has been executed just as well. There are many hurdles that must be overcome when designing an axle and this has managed to pass them all. A wide axle is very nice to have especially if you want to hold the diabolo by the axle, like Henri Kangas does with his ingenious diabolo style or countless other people do when they try to master the 4 diabolo hover (or 5D hover in my case ). An example of this being an issue are Taibolo diabolos which often apply too much pressure to the index finger to be able to do this comfortably (granted I may have very large, chunky hands but I can’t imagine it is much easier for other people). Luckily Hyperspin have avoided this trap and their diabolos are very nice to hold. Having a wide axle is all well and good however if you make the axle too big it not only makes the diabolo heavier as a whole but it also drastically changed the weight distribution (I imagine anyone who has owned the old Sundia Sun heavy edition diabolos are nodding in agreement here). Luckily Hyperspin seem to have used light materials for the axle so they don’t set any alarms off here either. The shape is also good, besides discrepancy in weight between cups there is another factor which may cause a diabolo to turn either away from you or towards you and that is the hubs/axle hitting the string either too far or too close to the player respectively. This effect is very noticeable with Epic diabolos, the axle itself is small (presumably to save on weight since the diabolo is heavy enough as it is) but the hubs provide a large area of contact and unless you catch the diabolo just right it they will alter the diabolo’s orientation, perhaps under certain circumstances this may be useful to some but in general I find it irritating since it means more corrections are needed. Luckily for Hyperspin, since both the hubs are small and seamlessly integrated and since the axle has a good shape this effect does not take place. There are a few more personal comments that I wish to add about this diabolo. Firstly I think it is important to mention how great these diabolos feel when doing suns. Since I first got them I loved doing continuous 53 suns and 3 diabolo feeds with them and they really lived up to their name ‘hyperspin’ since they seem to just glide across the string without losing much speed. Of course it is important to note that this feeling is also influenced by the string you use and since I have recently run out of Henry’s yellow string and switched to Play’s white string this hasn’t been as noticeable, hence I employ people to test what string works for them as well. The cups have a slightly bigger diameter than most other diabolos in this category. They do not have shallow cups even for an ogre with massive hands like me and as mentioned previously they have a wide axle so throwing into high with a variety of grips is possible. Personally I find that the material used works really well for my grip (flicking using the outer rim with my right hand) and so I raise no complaints but it should be noted to anyone interested that there is no pronounced lip like with finesse diabolos. I also know that some people prefer when the inside of the cup is perfectly smooth and that is the case here, there is no writing or other indentations on the inside that may be distracting or influence your grip. At the beginning I was worried about the durability, especially after reading the review Wis posted. However, I was told that the diabolos I had have been altered since his review and I have used these diabolos on concrete for both vertax and high diabolo where they have fallen from a variety of heights and at different angles and nothing has gone wrong with them so far. Perhaps I may be lucky but in general I think this shouldn’t be a cause for concern to most people. Many players have different habits so mileage may vary, I know for example that Damian has shredded through countless Sundia EVO axles while I only managed to miraculously bend one with my old EVO G1s presumably because I tightened it too hard and decided to play on a concrete surface, everyone’s story is different. I am more concerned though with their sharp shape and inflexible material, it is one of the reasons that they are not my preferred diabolos for high practice. Many times they have fallen on my hands and either cut my forearm or just caused a great deal of pain. That isn’t to say other diabolos don’t do this, I just found myself being a bit more careful with these than others. They are also rather loud when correcting due to their material, presumably because of the hard transparent plastic. This is the same material that the upcoming Hyperspin Zero diabolos feature and at the EJC many jokes were made on account of the ear piercing ring that tapping them produced. These diabolos are not as bad but they are certainly louder than comparable ones, although a quick remedy for this is to wear earphones and ignore complaints from roommates/neighbours/parents/anyone who can’t appreciate the beautiful art for that is diabolo. In conclusion I have really enjoyed using these diabolos. There has definitely been more thought put into them than just a unique aesthetic and I am sure that it will win a lot of people over on that basis alone. I haven’t been able to check whether the washers are metal or plastic or carbon fibre, if they are metal (as I suspect) then I would be curious to test the effect of lighter washers on the performance. I find it really promising that these days diabolos are measured by what is wrong with them (similar to the smartphone industry) because so many manufacturers get so many things right that they are pointless to mention. I realise that due to me being a numbers player my insight towards 1 and 2 diabolo performance may not be as in depth as someone else’s although I believe I have covered most of the important use cases and I recommend reading the review by Wis as well. If there are any specific questions that spring to mind then I invite anyone to ask it and I will be happy to answer.